Increased understanding of the role of the gut microbiota in health has highlighted the benefits of pre- and probiotics, and now, postbiotics are emerging as a further source of support for the development of a strong and stable immune system. Produced by a natural fermentation process, postbiotics have been shown to benefit the adaptive and innate immune system and improve gut barrier function¹⁻². A healthy gut microbiota composition is essential for optimal immune system development and function in infants, and has the potential to lower the risk of disease in infancy and beyond³. The human body is comprised of trillions of microbes (bacteria, viruses, fungi, etc) in addition to human cells. Estimates of the ratio of microbe to human cells have varied from 10:1, to more robust, recent research that suggests the split is much more of equal proportion⁴. The influence of these microbes on our health and body functions is far-reaching. The digestive tract is host to many of these microbes — the gut microbiota. Our digestive system could not function effectively without them. Bacteria in the gut are not only important for healthy digestion — they also play a vital role in metabolism, cognitive function and immunity⁵. The first 1,000 days is a critical window when the gut and immune system develop rapidly, as babies move from a protected environment to one where they are exposed to lots of immune challenges³. The development of healthy gut microbiota is essential for immune system development and function³. Early nutrition is the main influence on initial microbiota composition; and optimal nutrition fine-tunes the immune system and sets up metabolic homeostasis in early life, influencing long-term health³`⁵. Breastmilk is the best possible source of nutrition for a healthy microbiota composition⁶⁻⁷. Recent research suggests around 30% of gut microbiota in breast-fed infants comes directly from their mother’s milk⁸. As well as being an optimal source of beneficial bacteria, breastmilk contains prebiotic human milk oligosaccharides which positively shape the infants gut microbiota⁹. These prebiotics pass intact to the lower part of the infants’ gut where they are selectively fermented by beneficial bacteria such as bifidobacteria — allowing the amplification of these bacterial populations⁷`⁹. This fermentation process also creates postbiotics — bioactive components that play an important role in the regulation of biologic activity in the gut¹`⁷. Fermentation occurs naturally in the gut, but people have also used fermentation as a method of food preservation throughout history. There are a huge variety of fermented foods in many cultures, which are consumed for both taste and health benefits. It is now recognised that many of the health benefits of fermented foods can be attributed to the postbiotics that fermentation produces¹³. Fermented dairy products can improve gut health, increase infection-fighting antibodies and boost both humoral (immunity mediated by substances found in body fluids) and cell-mediated immunity¹³. Consumption of fermented dairy products has been shown to reduce the risk of several non-communicable diseases in adults¹⁴`¹⁵. 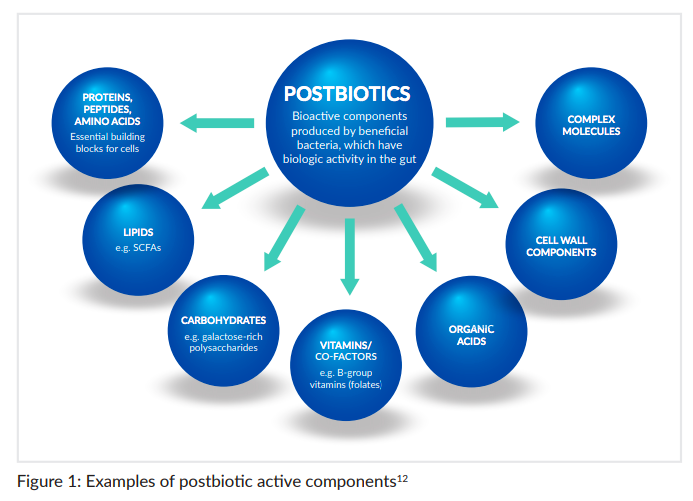 A whole range of postbiotic bioactive components are produced during fermentation including short-chain fatty acids (SCFAs), enzymes, peptides (proteins), polysaccharides, cell surface proteins, and vitamins (see Figure 1)¹². SCFAs are a source of energy for cells and help regulate energy homeostasis¹⁶. They possess antioxidative, anticarcinogenic and anti-inflammatory properties and play an essential role in the immune system¹⁷⁻²¹. 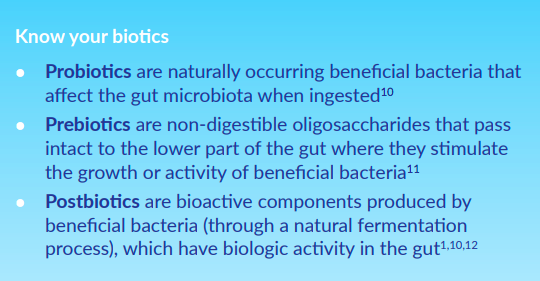 Postbiotics have been shown to support a healthy gut microbiota²². Regarding immune function, postbiotics have also been shown to improve the ability to fight infection by increasing the antibody response to pathogens²², as well as directly influencing gut barrier function¹ and intestinal immunity²⁴. Nutricia Early Life Nutrition has over 40 years of breast milk expertise with a dedicated team of around 250 specialist scientists collaborating with hospitals, laboratories and universities worldwide to ensure we’re leaders in this field. In this guide for healthcare professionals Nutricia Early Life Nutrition take a closer look at the benefits of postbiotics and its positive impact on gut health during the first 1,000 days.